A few years ago, the staff at my school began learning about inquiry research. We used the book, Comprehension & Collaboration: Inquiry Circles in Action, by Harvey and Daniels, as a guide to think differently about how students could learn. Over the course of two years or so, we learned, tried things out, shared ideas with each other, tried more, and eventually Inquiry became a driving force in our school. Questions drive the research, not topics. Collaboration within a group is vital, and must be taught. In the early years of our "inquiry revolution," my third grade team and I did large inquiry-based research projects centered around a theme. We did an "Immigration" inquiry project near Thanksgiving, and an "Environmental Issues" inquiry project in the spring. Once we identified strong inquiry questions, students chose which question they wanted to research, and we formed small groups of inquiry teams. During the research phase, we would infuse strategy lessons on collaborating successfully, on finding relevant information, and on recording notes. After researching and gathering information, students then decided how best to share their information. We usually required some sort of visual aid and some sort of spoken element. Students worked to create their final "products" and then presented them to the entire class. As students school-wide experienced more inquiry-based projects, I was noticing that each year, students were coming into third grade as more sophisticated "inquirers." I had to take advantage of this. 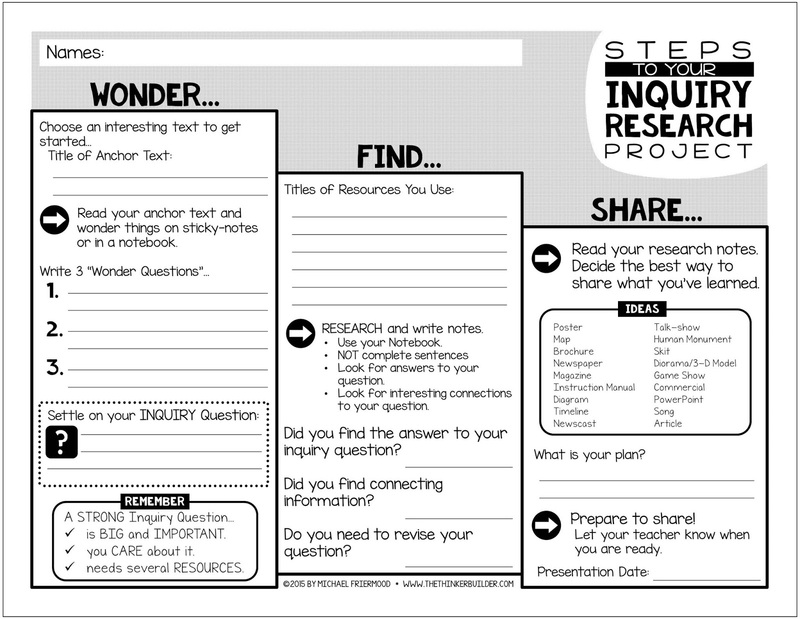 I decided to start making "inquiry research" one of students' choices in our Daily 5 framework, where students could choose to initiate their own inquiry research projects. Making it happen wasn't easy. 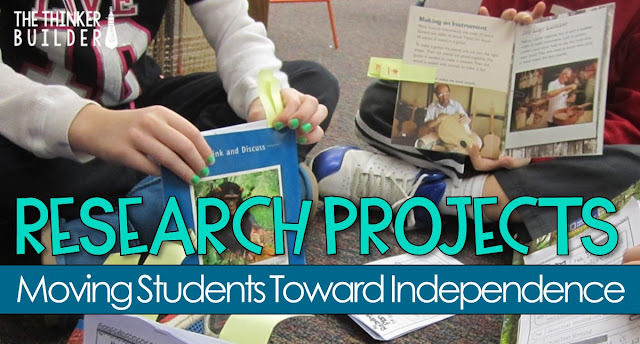 I needed students to be able to do the bulk of the project independently. Not alone--they'd still be working with each other. But independent in the sense that groups would not rely on me, since I would be meeting with guided reading groups during Daily 5. 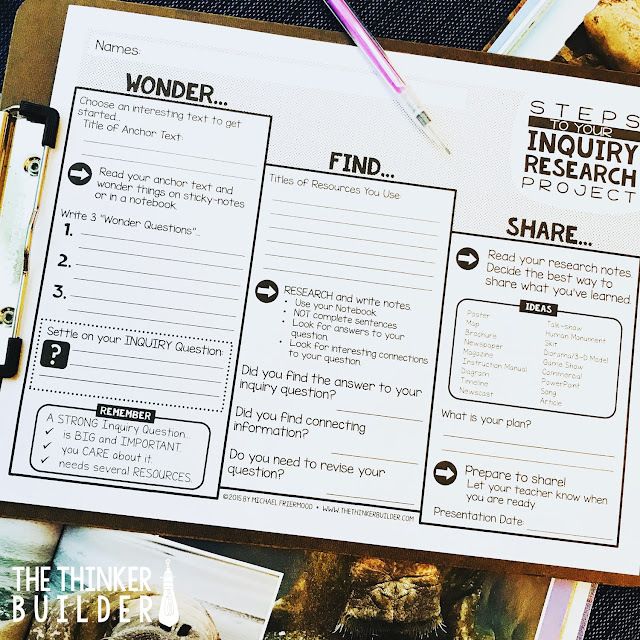 Agreeing on how to get started: Students find a partner or a group of three with a shared interest, and then together find an "anchor text" that will help them generate possible inquiry questions. Keeping commitments: It's important that a student doesn't get involved in an inquiry group only to abandon the group halfway through. Asking strong inquiry questions: Getting students to "think big" takes practice and modeling. Finding resources: Students need a procedure for when they can go to the library to find additional resources. 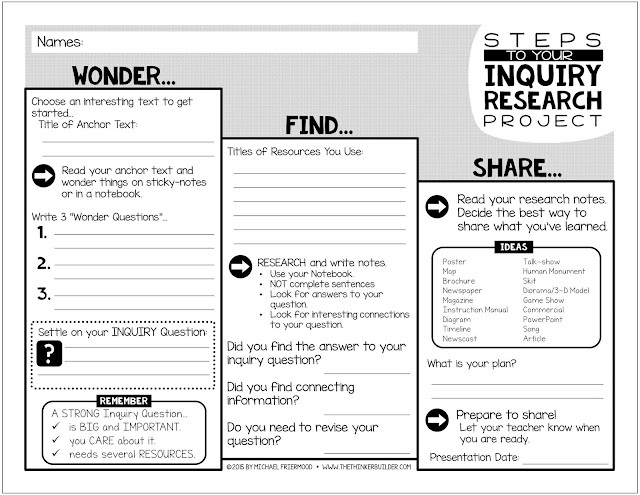 Researching BEFORE creating: Students often want to reverse the inquiry process. A group might share a PowerPoint presentation to the class, and then a student thinks, "I want to make a PowerPoint too. Let's see, what could I do one about?" When really, the answers and information learned through their research should determine the best "vehicle" to share it. Checking in with the teacher: We establish checkpoints in which students briefly meet with me before moving on to the next phase. For me, I (1) approve the group's inquiry question before they begin research, (2) approve the group's plan for what to create, and (3) schedule a presentation date and time. Creating an anchor chart of the agreed upon procedures. Just like with our other Daily 5 choices like Read-to-Self, Read-with-Partner, Word Work, and Writing, gaining independence with Inquiry Research is built over time, and procedures are revisited and refined as needed. To help students gather and organize their research, I give them a half-sheet research notebook, like in the following photos. 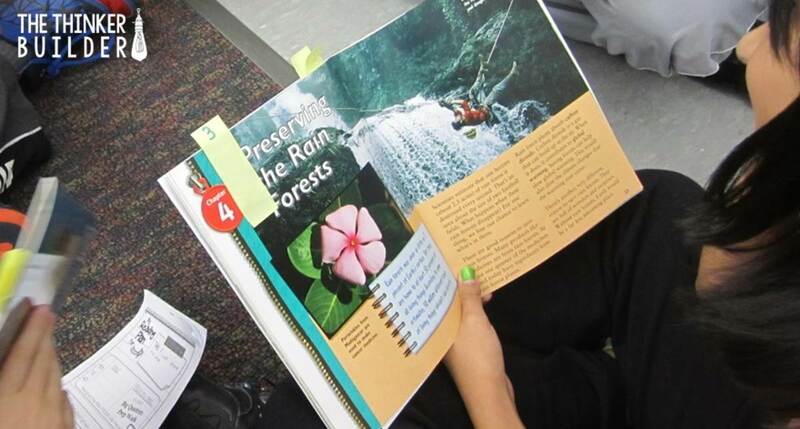 These notebook pages help students breakdown their research into manageable parts. 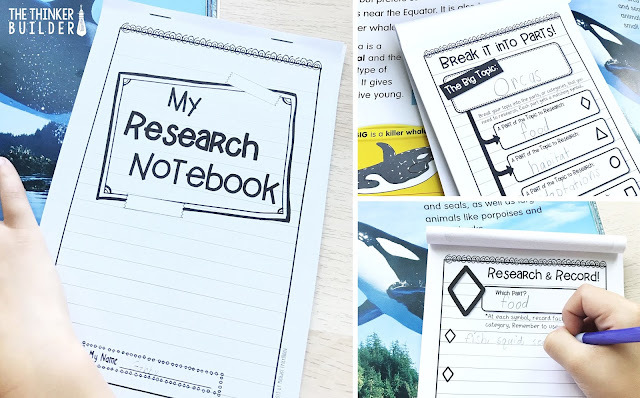 (Plus, you'd be surprised how motivating it is to have their own little research notebook.) These pages are part of my highly versatile, differentiated Response Pages for Informational Text resource. Check it out! Giving students ownership of what they are learning brings with it high motivation, and in turn, high engagement. As a side benefit, I can rely on students to be productive at this Daily 5 (or reader's workshop) choice. But more importantly, these projects matter to students. They want to find out answers to their questions. They are proud of what they create. And that makes their teacher proud too.